As discussed in other blog entries, eating a sustainable diet is vital if we are to reach the 2c target set down by the Paris Agreement . Evidence for the environmental benefits of reducing consumption of meat and dairy products is continuing to build [2-6]. If we don’t begin to tackle the demand-side of agriculture, particularly meat and dairy consumption and current diets are left unchecked, agriculture will use up to 20 of the 23 GtCO2e yearly limit to 2050 . Furthermore, it’s important to acknowledge the ‘health co-benefits’ of eating an environmentally friendly sustainable diet. Focusing on meat and dairy consumption, a new study in the US has highlighted the benefits of substituting animal based protein with plant based proteins https://archinte.jamanetwork.com/article.aspx?articleid=2540540. It found that for every 3% calorie increase in plant protein the risk of death from all causes is reduced by 10%. It also emphasises a 12% reduced risk of death from heart disease . 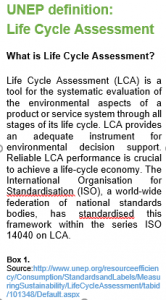 In the field of sustainable diets, we refer to the CO2 Eq of beef, lamb, pork etc. which allows one to quantify and compare the carbon footprint of eating, for example a kilo of beef versus a kilo of chicken. However, a quick glance at the literature and one soon sees the wide variation and difference in CO2-eg figures for products. Why is this the case? 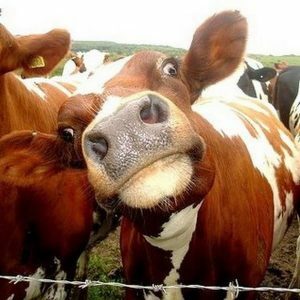 Why does one paper suggest the CO2 of beef is 17.4 CO2-Eq per kg of beef  and another gives a figure of 46.2 C02-Eq per kg of beef . 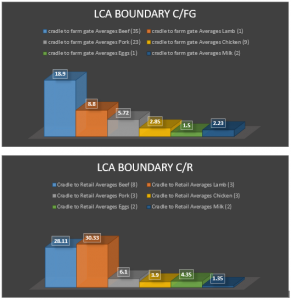 For example, the LCA boundary for beef in one study may only assess the emission from ‘cradle to farm gate’ thereby excluding all emissions post farm gate like energy associated with slaughter, transport, refrigeration and packaging. Another study may define its ‘functional unit’ of measurement as the CO2-Eq per LIVE weight of beef (excluding slaughter, transport etc.) or CO2-Eq per carcass weight (including slaughter, transport etc.) It may or may not account for associated land-use change (LUC) in beef production. For all these reason, when one wishes to compare carbon footprints they must acknowledge and account for the variations in LCA methods. As such, comparability of meat carbon footprints can be marred by a lot uncertainties  and caution should be taken when comparing one countries beef carbon footprint to another. This was one of the greatest challenges of my thesis, choosing which carbon footprint to use for ‘meat’. As you can see from the below graphs, the CO2-Eq figures vary by geography, by LCA system boundaries and characterisation factors. The carbon footprint of beef can also vary based on the production system, for example was the beef apart of a pasture, organic or feedlot production system. 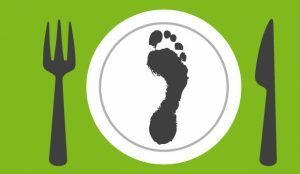 It is imperative that we develop a methodology to allow for comparsions on ‘meat’ carbon footprints and its good to see discussions on the need to harmonise LCA methods and approaches have already begun https://www.carbontrust.com/news/2016/02/footprints-without-borders-product-carbon-footprinting-framework-east-asia/. Despite the geography, complexities and difference in the carbon footprint of ‘meat’ products – one message is clear, beef has the highest CO2-Eq and as such, the highest environmental and climate impact [2-5]. As a result, the need to reduce consumption is vital if we are to stay within the 2c target agreed this year at the UNFCCC Paris meeting. China, an ‘emerging’ economy has taken a bold step in the right direction by updating its dietary guidelines to include issues of sustainability. As explained in pervious post’s – what you eat matters and eating animal products carries a heavy environmental footprint with it [1, 2]. There are many ways to begin the transition to sustainable diets from education, advertising, choice editing by supermarkets to hard policy options like taxes on unsustainable foods and subsidies on alternatives [3, 4]. 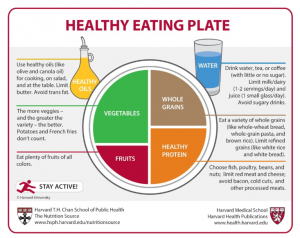 Another way is through national dietary guidelines. The Food Climate Research Network (FCRN) recently released a new paper looking at national dietary guidelines that factor in issues of sustainability . They looked at what governments were taking progressive steps to introduce the concept of sustainable diets to citizens. They highlight 4 different countries with official national dietary guidelines that best take account of issues around diet sustainability; Germany, Brazil, Sweden, Qatar. Although not specifically mentioning sustainable diets – each offer recommendations that are concerned about what products are good for health and in doing so have the added co-benefit of addressing environmental concerns. 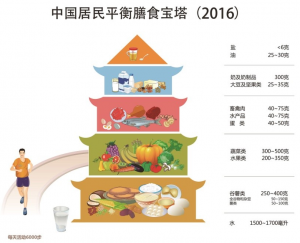 Only a month or so later after the FCRN publication – China takes a big progressive step and releases its new dietary guidelines that, most importantly, recommend a range, in grams per week, to keep meat consumption to! 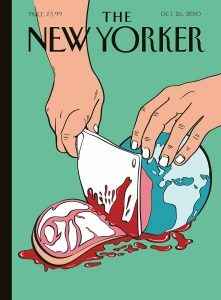 (See links: http://dg.en.cnsoc.org/ | https://www.theguardian.com/world/2016/jun/20/chinas-meat-consumption-climate-change?CMP=share_btn_fb). If every person in China was to take these guidelines on board and transition to lower-meat diets – WildAid suggest it could reduce GLOBAL agricultural emission by 22% a much needed reduction if we are to meet the Paris Agreement 2c UNFCCC target. The report emphasizes the co-benefits for planet and human health and underlines the extensive impact demand-side measures can have on reducing emissions. Nonetheless, dietary guidelines are of no-use if they are not communicated to the general public, a concern further discussed in the recent FCRN paper . Interestingly, in China, The Chinese Nutrition Society (CNS) has recruited the help of big name celebrities to advocate for reduced meat consumption. The ‘Less Meat – Less Heat” video is the first of its kind and it will be interesting to see what impact it has, if any. If researchers find it has had an impact, directly or indirectly, it again shows the power of advertising and marketing, an element that can be a hindrance or assistance in any transitions to more sustainable diets. Diets & Climate Change | What you eat matters! However, most of us are unaware that what you eat also impacts the environment. We know that eating healthily/unhealthily impacts your body but few know the damage it has on the planet! How can your eating habits be connected to climate change? Animal product are of particular concern for climate change[1, 2]. 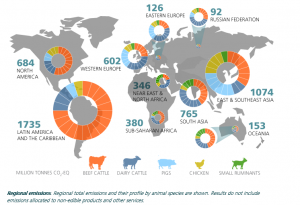 Livestock production is the largest contributor to agriculture’s carbon footprint, estimated to account for 14% of anthropogenic emissions, with animal feed production/processing and enteric fermentation accounting for 45% and 39% respectively . The greenhouses gases attributed to that steak you ate can be several times more than eating the equivalent weight in vegetables, legumes, beans or pulse [2, 4, 5]. The carbon footprint of meat, beef in particular can be anywhere from 3 to 10 times larger than that of pig-meat or chicken  Why the large range, because the carbon footprint is dependent on the production systems for beef. 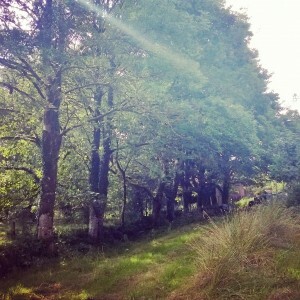 For example, livestock production in South America, particularly in Brazil and been linked with deforestation. Over 3 million hectares per year of tropical rainforest is lost, 70% of which is occurring in Latin America . Livestock production is also a big user of water, with the average 150 gram beef burger utilizing 2400 litres of water and a 200ml glass of milk using up to 200 litres of water . An important fact to consider since ‘water crisis’ is among the top 3 big ‘risks’ list from the World Economic Forum (WEF) at Davos’ since 2014. If you want to make a difference, in reality a vegan diet is the most environmentally sustainable  with vegetarian diets coming second [9, 10] both can still meet the nutritional requirements of humans. However, education on what to eat and how to eat vegan/vegetarian is one of the biggest barriers to change . That is not to say that cultural, tradition and consumer behaviour change aren’t also barriers to change. They too have a large role to play in stalling transitions to sustainable diets. But then again, what is a sustainable diet? 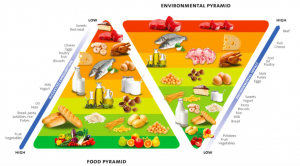 Researchers have been endeavouring to define the ‘sustainable diet’ and some have developed ‘guidelines’ and food pyramids. Nonetheless, the term sustainable is often dependent on how it is defined and so to are sustainable diets. Should environmental, health, social and economic issues take precedent? 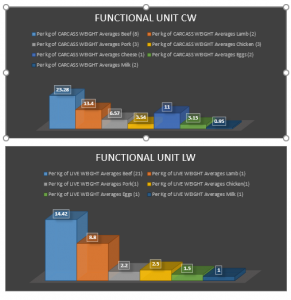 How do we give equal weight to each? Can we give equal weight to each and still meet the requirements of health? Can a environmentally sustainable diet also help meet socio-economic goals (for example almost 60 million poor small-holders rely on livestock production [3, 12, 13]). These are just some of the questions researchers are considering. Nevertheless, one message is clear, current consumption levels of animal products are not sustainable in the context of climate change. An issue further amplified by the growth and demand of animal products in developing countries. However, the bulk of responsibility for changing diets lies with developed nations. I highly recommend that you take 10 minutes to read and browse through this excellent report from the Institute on the Environment at the University of Minnesota. It gives a fantastic ‘round-up’ of current knowledge on the complex, multifaceted and interconnected issue of climate change, agriculture and food nutritional security. The convergence of a rising world population, expected to surpass 9 billion by 2050, and the onset of climate change means humanity is facing perhaps its greatest challenge . Food production both relies on and alters the very biological and material world on which it relies . Agriculture is responsible for 47% of total anthropogenic methane emissions and 58% of nitrous oxide . Moreover, livestock production is the largest contributor to agriculture’s carbon footprint, estimated to account for 14% of anthropogenic emissions, with animal feed production/processing and enteric fermentation accounting for 45% and 39% respectively . Furthermore, present day farming practices have serious effects beyond contributing to greenhouse gases (GHG’s). Of all the land used for agriculture, 80% is given over to livestock production and is linked with mass deforestation; 3 million hectares per year, 70% of which is occurring in Latin America . Food production also uses up to 70% of all freshwater , with livestock contributing most to the sectors associated with water pollution [9, 10]. In addition, modern agricultural methods are implicated in biodiversity loss, soil depletion and degradation [2, 5, 6, 11] such that some [4, 12] now suggest that agriculture has surpassed the environmental limits in which we live. All of these factors threaten the world’s ability to produce food into the future . 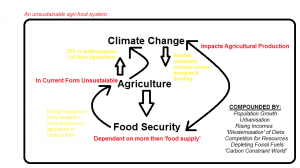 Climate change also directly hinders the ability of agriculture to meet future food demands. It jeopardises the natural resources, water, biodiversity and soils on which agriculture relies and as such may see a material geographical shift in the production of soft commodities . Moreover, climate change will result in deteriorating yields in some crops [2, 7, 14] and create harsher and more unpredictable conditions for producing agricultural commodities. Consequently, extensive and wide ranging research into how we can develop solutions to the ‘CCAFS’ problem is underway, covering areas such as sustainable intensification, closing the yield gaps and climate-smart agriculture. The issue is, more often than not , conceived as issues of production . However, it is the combination of both the production and subsequent consumption that makes food the biggest utilizer of natural resources . If we are to meet future demands in addition to reducing agriculture’s environmental impact, then demand-side efficiency must also be addressed. I’m lucky enough to be able carry out my Master thesis research at CIAT’s headquarters, just outside Cali in Colombia! So far the experience has been fantastic, in spite of my poor Spanish, but mainly thanks to the help of a CIAT Chemist, Lucia! Being so close to the equator, it’s bright here from 5.30am & dark come 6pm. This means I’m up at 5.30am, I catch the iconic CIAT bus at 6.30am & am in my office by 7.3oam. The early start is easy when you have the pleasure of being in the surrounds of the headquarters here. It’s a breath of fresh, tropical, air! 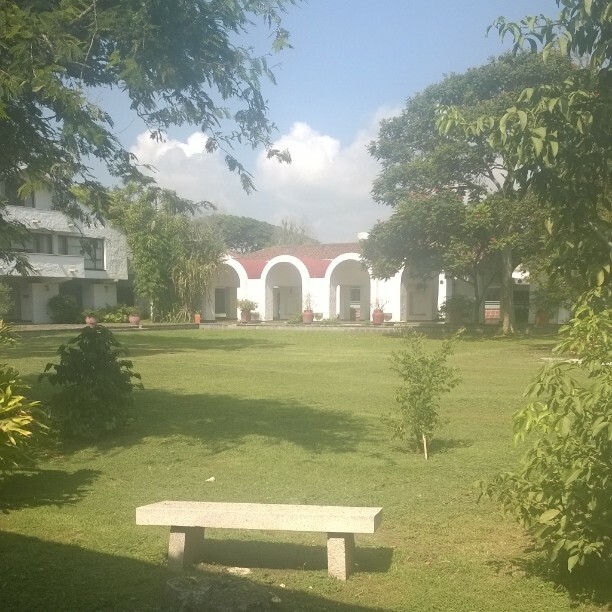 CIAT staff can avail of the swimming pool, gym, fitness classes or a run around the grounds of the campus at lunch time or after 4.30pm. This promotes a healthy work environment, which in times when you are engrossed in a literature review or lost in data, it is a much needed opportunity to escape, refresh & come back to your work with a clear mind again! Its protection is vital for food security.